A great presentation about the benefits of diversification is presented by Charles Schwab as they develop their “Intelligent Portfolio” for small net worth individuals. While they present a compelling case, the fact is, it results in a portfolio that consists of 19 securities! Try building and maintaining that with your $400 monthly investment. 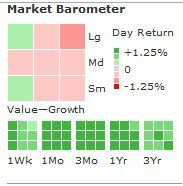 And, the performance comes no where near a simple investment in VTI. Many financial advisors recommend that your portfolio be diversified by asset class. That is, have your funds distributed among several, non-correlated classes of assets. 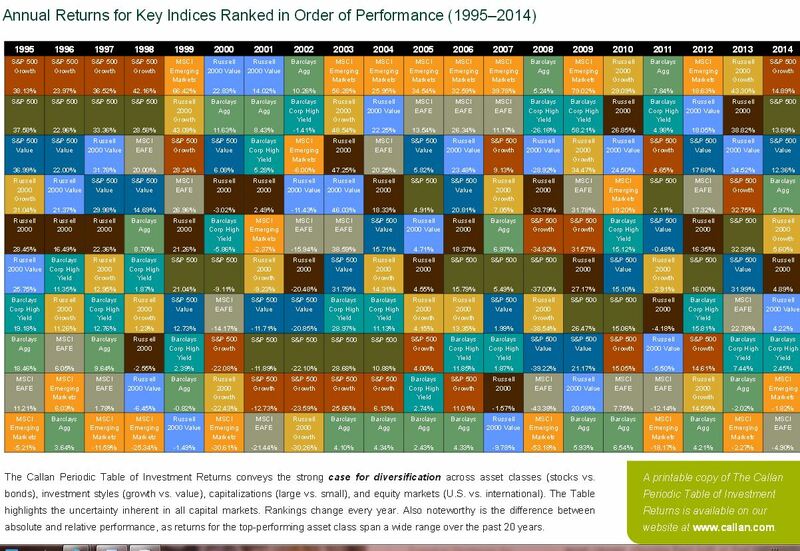 Another type of portfolio diversification is diversification by sector of the economy. The idea is that an investor should distribute his money among several sectors of the economy. Here are the sectors, serveral of which should be represented in your diversified portfolio. over one week, one Month, three months, One year, and in three years. The idea is that not all asset classes, sectors, and categories will be moving in the same direction at the same time. By having your assets distributed among several asset classes, sectors and/or categories, the violent swings of the market will be dampened. You own both the zigs and the zags. One of the strongest arguments for a Diversified Portfolio is a table developed by Callan Associates which presents different asset classes and styles ranked each year by their performance. The above table demonstrates conclusively that there is no one asset class or sector that is consistently up or down (just have a look at MCSI Emerging Markets). The distribution of returns is obviously random. The conventional wisdom is that in order to have a strong portfolio, one’s portfolio should be invested in several of the categories. Future Advisors is an investment advisory firm that advocates a highly diversified portfolio and they will help you (for a fee) construct a diversified portfolio that “they think” is a good one. Below are their rationales for including the various asset classes that they do. Within stocks, experts recommend  diversifying between U.S. Domestic Stocks, especially Small Cap and Value, Foreign, Emerging Markets, and Real Estate Investment Trusts. US Domestic Stock takes up more room in the portfolio than any other asset class because of it’s incredible long-term historical returns. Stocks in companies based in other developed countries allow US-based investors to receive equity-level returns while diversifying across geographies. Funds that invest in countries with an emerging economy, such as China, Brazil, India, and Russia play a small but important role in our portfolio strategy. Experts recommend  Real Estate Investment Trusts (REITs) be included in a long-term portfolio to add more diversification than domestic and international stocks can deliver alone. REITs are funds that invest in companies whose primary income comes from owning buildings and land, thus participating in the long-term growth of real estate prices. Within bonds, experts  recommend a split between regular nominal bonds of high credit quality and Treasury Inflation Protected Securities (TIPS). Investment-grade corporate bonds as well as US Treasury and Agency bonds provide a measure of safe haven in turbulent markets as well as diversified growth in bear markets. Treasury Inflation Protected Securities (TIPS) are unique Treasury Bonds whose coupon payments increase as inflation increases. They provide unique pure protection against inflation, while also being a safe haven in times of crisis due to their credit quality. The case for the inclusion of REITs in the recommended portfolio is eloquently presented by, among others, Larry Swedroe and David Swensen. Previous academic research by, among others, Chen et al (2005) and Kuhle (1987) shows that historically the inclusion of REITs in an otherwise equity portfolio has added diversification value. For a further discussion of REITs and their role in a long-term portfolio see “Chen, Hsuan-Chi et. al. Real Estate Investment Trusts. The Journal of Portfolio Management. 2005, Vol. 31, No. 5: pp. 46-54″ and “Kuhle, James L. Portfolio Diversification and Return Benefits–Common Stock vs. Real Estate Investment Trusts (REITs). Journal of Real Estate Research. 1987, Vol. 2, Issue 2.